Many pancreatic cancer patients are diagnosed after the cancer has spread beyond the pancreas, making surgery a risky treatment option. But for those patients whose cancer is localized, surgery may be used to remove the tumor and prevent further spread. When the tumor is confined to the head or neck of the pancreas, the “Whipple” operation (or pancreaticoduodenectomy) is the most common procedure. 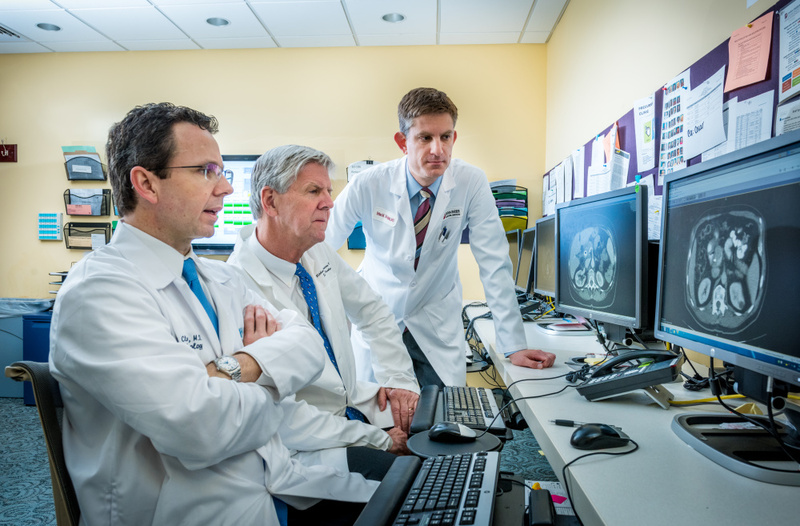 Surgical oncologists Thomas Clancy, MD, (left) and Richard Swanson, MD, work with medical oncologists including Brian Wolpin, MD, (right) to treat patients with pancreatic cancer. During the Whipple operation, a complex procedure lasting about six hours, surgeons will first check to make sure the tumor has not spread. They then remove the head of the pancreas; the duodenum, part of the small intestine; a portion of the bile duct; the gallbladder; and sometimes part of the stomach and nearby lymph nodes. After removing these internal organs, surgeons connect the remaining pancreas, bile duct, and small intestine so the body can digest food normally. Dana-Farber nutritionists will often recommend patients eat small, frequent meals after the procedure until the stomach is able to empty itself properly. Patients also require close follow up to monitor for any evidence of diabetes or decreased pancreatic function. Learn more about treatment for pancreatic cancer, which may also require chemotherapy and radiation therapy, from the Pancreas and Biliary Tumor Center at Dana-Farber/Brigham and Women’s Cancer Center.